Exactly three years ago, I moved to Denver with aspirations to work in Education at the Denver Art Museum (DAM). 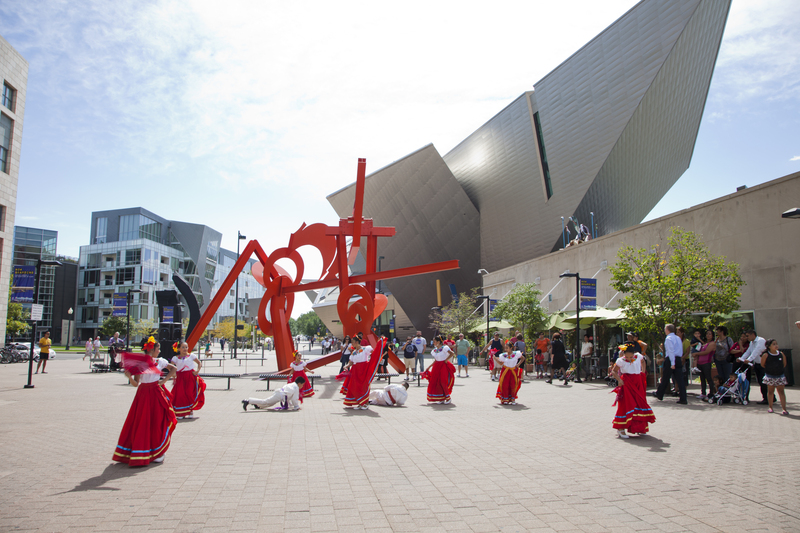 As I write this post, I can proudly say that I have worked as the Latino Cultural Programs Coordinator at the Denver Art Museum for over a year. Though I discovered several years ago that museum education was my “calling,” I am still often surprised that I hold the position I do at an institution long respected in the field for its innovative educational programs. Maybe it was because I had seen one too many slightly confused faces around interview tables when hiring committees tried to make sense of my varied experience as a student mentor; community organizer; volunteer coordinator; advocate for educational access; and expertise in Spanish colonial art history and museum practices. I am thankful, though, that the staff at DAM recognized there is something useful about hiring an activist art historian that has an interest in changing the way museums interact with their surrounding communities. My current supervisor only became more pleased when I pontificated on why museums are exactly the place to engage diverse audiences, despite the fact that it too rarely happens on site. Reflecting on the past year, I can say that we have made big strides in terms of engaging our Latino audiences, and we are working on innovative projects with those audiences in mind. Yet, considering the intricacies of our quickly changing communities, we have mountains of work ahead of us. To me, it is an exciting challenge, not an insurmountable task. The DAM has a long history of engaging Latino audiences, partly because it has been considering how museum education can help make the institution more comfortable and inclusive for broad audiences for awhile. For example, we have had a full-time, fully-funded Spanish Language and Community Outreach Coordinator position for a long time now. She has worked tirelessly to invite Spanish speaking visitors to experience the DAM, and consider how the voice of Family Programs is a bilingual one. A museum that prioritizes families, and speaks bilingually, as we do, often indicates a place that feels inclusive for everyone. Unfortunately, numbers show this is not the case. With the Latino population in Denver reaching 30%, audience figures for our museum, those around the metro area, and nationwide show a small fraction of Latinos in attendance. Despite our long and hard work, museums do not seem to fit the bill for our Latino community members. Perhaps inviting people to partake in an experience falls flat when there are few resources available for that audiences on site? This question was the impetus for the establishment of my position. My position of Latino Programs Coordinator at the DAM is important because my role is to promote change on-site, first through regular educational programs (CelebrARTE being at the forefront), and then throughout the institution. I plant kernels of ideas around the institution to get everyone thinking of how they can serve the needs of Latino audiences through their own role in the museum. The reality is that there isn’t a simple solution for museums to implement in view of making a particular audience segment become engaged on-site. I could not, in my role as an educator, do all that it takes to meet the needs of these audiences. I can, however, listen to our audiences’ needs, implement what I can, and encourage other members of the institution to do their part. This, in my opinion, is what makes a museum inclusive. Inclusion requires everyone’s efforts. The fact that managers across departments of the DAM are really thinking about how they can best serve the needs of our Latino audiences by, for example, changing their communications messages, thinking about how digital media can revolutionize engagement, or including more diverse exhibitions means that staff is listening. Through me, they hear the recommendations of our community synthesized into actionable next steps. Traditionally, encouraging such large-scale change has been met with resistance in museums, but times are changing. Museums across the nation are recognizing that we are all affected by demographic and economic changes. The DAM has a history of being a comfortable and welcoming place, so I run into few road-blocks, thankfully. As usual, the major obstacles are resources and staffing. It only goes so far to act inclusive if an institution will not put its money where its mouth is, or diversify its staff makeup. I think that as cultural programs become more successful, and audience builds, there will be little choice but to make sure the staff reflects the make-up of the community, and funding proves that the institution supports all audiences equally. Stay-tuned for more on the makings of CelebrARTE! Madalena Salazar is the Latino Cultural Programs Coordinator at the DAM. She developed, launched, and manages DAM’s first monthly, bilingual family program, CelebrARTE, which celebrates the arts and cultures of Latinos in Denver and beyond. This program is at the heart of the DAM’s institution-wide efforts to better serve the needs of their diverse, Latino community members. Congratulations for this article! It’s hugely important to hear from colleagues working in the trenches of audience diversification what works and how you do it. I think experiences like this will help other museums to start thinking about what they can do and the best way to do it. Sharing your experience is necessary for everyone. Keep up the good work! Thank you, Madalena, for the update on the work that you and DAM are doing. The idea that “There is nothing more culturally relevant than being able to spend time as a family” is a fascinating one, especially since I know so many museum education professionals dedicate significant effort to fostering dynamic intergenerational/family learning. I wonder: are your Latino family visitors coming to DAM primarily because of the availability of bilingual programming and staff? Are they returning for programs that are not bilingual? Your visitor’s statement suggests that Spanish-language programming and family enjoyment are tightly linked, and I wonder if other Latino visitors bear out this idea. Also, thank you for articulating that “inclusion requires everyone’s efforts.” Though making changes across the museum can be difficult, recognizing that the visitors’ sense of inclusion is impacted by staff throughout the institution–from security guards to the exhibition designers–is a critical step in getting museum professionals to work differently. Thank you, Salvador and Verónica! I hope that soon I will be able to show that while we have a great base to build on, we certainly have a lot to learn about the nuances in our audiences. Verónica, first, while I think that most museums try very hard to serve the needs of families learning together, it is only recently that they have begun to think of families as being made up of extended, intergenerational family groups. For so long, “family” audiences were parents with their children between the ages of 5-10. Now we are thinking about parents with teens, babies, grandparents, tíos, cousins, etc. Furthermore, while family programs are culturally relevant to Latinos, I think both our visitor research and Cecilia Garibay’s research points out that Latino families have slightly different goals for family learning/experiences. They often parallel mainstream audiences, but sometimes have a different emphasis. To more specifically answer your question, yes, I do think that Latino families are coming to CelebrARTE and Día del Niño because we have bilingual staff. We also find a more diverse audience make up during First Free Saturdays, which also feature our Spanish Language Guides. Many of CelebrARTE’s repeat visitors are families that are trying to raise their children bilingually, and many have noted that they enjoy the opportunity to pass along their “home” culture to their children being raised in the US. Some families have noted that they will come to other DAM family programs that are not bilingual. These are the Latino families that are highly engaged in the DAM and are often members. 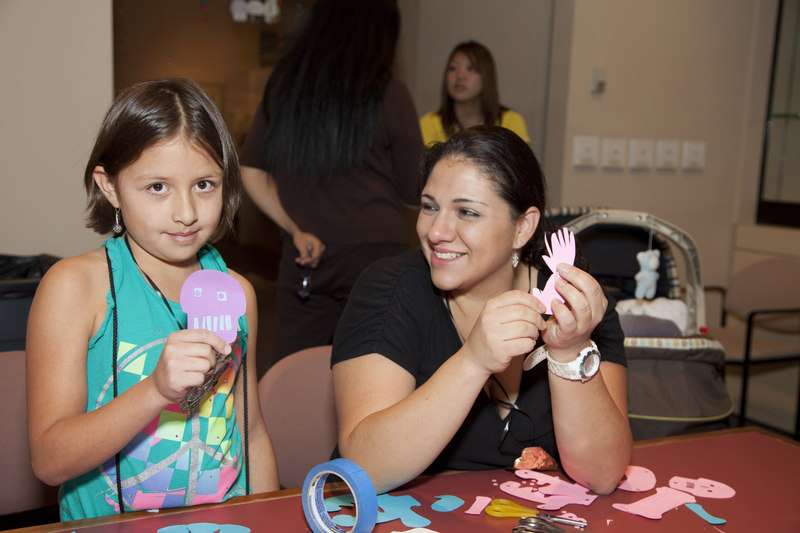 From the families that come less often, I get the sense that they enjoy coming to the museum, but make a much greater effort to come on days where they know there is going to be bilingual staff/program. Thanks again for your support. I look forward to staying in touch with you. I think we have all come to the realization that everyone across institutions need to be on board for real change to occur, and the more voices that are able to push for institution-wide inclusion, the more quickly our institutions will really reflect the rich cultures and perspectives found throughout the communities they represent. Thanks, Madalena! I am working on a Latino outreach initiative at a children’s museum in the Southeast and would love to chat. Can you shoot me an email? Thanks! Happy to chat at your convenience. My email is included here. Thanks! I have completed my master’s thesis on the Museum of Fine art Houston’s effort to engage and better serve our city’s growing latino population so it was with much interest that I read this blog. I firmly agree that any change to diversify an audience needs to be institution-wide so I endorse your approach to get all managers, across departments, to think about how they can also contribute to this effort. My interviews in Houston’s Latino neighborhood re-iterate your findings that Latinos are family-centric and enjoy doing things as a family, which can mean large numbers and sensitivity to entrance fees. Thank you for sharing your ideas and successes with us: I will continue to follow your blog with great interest. Thanks, Hadia. I appreciate your work on MFAH. I would also be very interested to hear more about your findings in your MA thesis, and I would be very interested to talk more with you personally. You can always reach me at msalazar@denverartmuseum.org. Thanks for your article, I am currently doing education outreach for the Latino community in Utah and it has being challenging to get people interested in our program. What ways of marketing would you recommend? Hi Anita. Unfortunately, I have to say that marketing and awareness has been out biggest challenge, and it seems that is the case for many institutions. We have good relationships with Spanish language media, and a partnership with the local Telemundo station. I think Salvador (see comment above) has had some really great suggestions in terms of marketing. Messages that are important are to express that it is family friendly, educational, fun, bilingual (when possible), welcoming/relaxed, and there is easy access (transportation, cost, etc). First, I think it is important to cultivate relationships with Spanish language media. However, I think the best marketing has been word of mouth. When you are out in the community and get to know people, word spreads, especially if you are honestly committed to that community and it isn’t just lip service. We are still having a tough time getting people interested in our programs too, but those who come have expressed having had a wonderful experience and become committed to the program. It is that initial awareness, and my only solution is really going above and beyond to be “on the ground” inviting people and answering questions at every opportunity. Thanks for your reply, Madalena. Out of curiosity, had the museum done any research to determine if and how Latino community members might want to connect to the museum? What can the museum offer that is not already provided by (possibly) more trusted organizations? How would they design an ideal museum program? That’s a tricky question, in a way. First, stay tuned, as I am in the midst of writing a follow up blog post focusing on what we have learned from our audiences. We have conducted visitor evaluations, yes. We have also worked for years with a committee of Latino leaders that care about this institution and its impact in the Latino community, and they have helped consult on programs. Our visitors often have not been able to explicitly describe exactly what kind of program they want out of the DAM. They have said they value interactive, family-oriented, bilingual programming. They have told us that it is important to share and learn about culture – theirs and others. They want the opportunities to feel comfortable speaking Spanish and for their family to become more united enjoying their time learning and playing together. I think what is unique to an encyclopedic institution like ours is that our Latino visitors value being able to be exposed to world cultures, and have the opportunity to learn new things, and when possible, understand the similarities and differences in their own cultural experiences. We do also tend to see differences in what is wanted out of a museum depending on levels of acculturation. Therefore, as with any museum program – a variety of experiences are incredibly important. That’s why engaging Latino audiences cannot be solved only through one means, but through a multifaceted strategy that includes all levels of the institution. I am also always open to discussing over email and phone in more detail. Please feel free to contact me! Thanks for sharing these insights Madalena. I have made similar suggestions to the Museum of Fine Arts Houston (MFAH), and have similarly learned from my audience surveys that Latinos enjoy their museum visit more when they see their culture reflected in the objects or exhibitions on display, that they value family programs and they also enjoy learning about other people’s cultures. One of the suggestions I made was to invite more local Latino artists to connect the works in the museums’ collection to works from their culture in order to understand similarities and differences. Intergenerational programs are also relevant for Latinos since many tend to live in households with grandparents, uncles, cousins, etc. Most importantly, I appreciated your comment to develop a multifaceted strategy to engage the Latinos. They are not a homogeneous group and their level of acculturation and assimilation play a big role in how they connect to the museum experience (again, this is a generation issue as well). I am loving this space for our conversation…It is very relevant and very important. I will re-connect when I return from my conference in Seattle where I will be presenting my thesis findings. Who is the author of this online article? Madalena Salazar, Latino Cultural Programs Coordinator at the Denver Art Museums is the author.